Every so often, I go on a tagging and filing spree. It took me a couple of hours, but I finally cleared the 700+ items that had piled up in my Evernote inbox. I was thinking about how to get even better at this because Timothy Kenny told me how he has a virtual assistant file the notes in his Microsoft OneNote notebooks. Is my filing really worth it? Is it something I value enough to pay someone else to do? Could I explain what I wanted clearly enough so that other people could do it? Could I benefit from organization even if I’m not the one organizing things myself? Before I dig into that, I should probably examine this question: What do I use Evernote for, and what could “better” look like? Visual library Visual thesaurus / sketches of abstract and concrete stuff Notebook, titles updated, duplicates merged Improve workflow – delegate titling? People, conversations Quick notes from my mobile Notebook Add full names; consider Evernote Hello for mobile input? Ideas and thoughts Quick notes from my mobile Notebook Should have weekly task to review and act on; separate from main Inbox? Private notes Things that I might want to remember or write about someday, but not yet Notebook Have an outline? Blog post ideas Inspiration, drafts, links, images, checklists Notebook, some tags Add links to outline? Business and personal receipts Back up business and personal receipts; possibly be able to search through them Notebook; tags, or just use folders on my drive? Decide where to do the organization; have an assistant retitle before import? A. Researching a topic, which results in lots of clips related to a single topic. Usually in preparation for a blog post or as a way to answer a question. E. Automatically clipping things based on external input, using services like IFTTT to archive my blog posts. A. Spend a few extra seconds tagging and filing things when I clip them. Advantage: I touch something once, so I don’t have to recall the context of an item. B. Capture everything into an !Inbox, then file shortly after clipping. Advantages: I can select multiple entries and tag them give them the same tags, and copy all the note links in one go. C. Capture everything into an !Inbox, then file weekly. This is my current strategy. This isn’t working out too well – things pile up. D. Capture everything into an !Inbox, then teach someone to file. I think strategy B will give me a good improvement in performance without me needing to bring in someone else. One of the areas that I could generally improve in is integrating the notes into my outlines and plans. Instead of just collecting the information, maybe I can use Copy Note Link and then spend some time adding those links to my outline. Alternatively, I can copy the source URL right then and there, find where it fits into my outline, and paste the link. If org2blog respects comments, I could even use that as part of my workflow. If I were to outsource more tasks in order to improve my effectiveness at learning, I think I’d gain more value from finding someone who can speed-read like I do, filtering through lots of cruft on the Internet to find high-quality resources. They could then clip those pages into Evernote for my review. That might be worth an experiment or two… Let’s find out how that works! I don’t have to look down when taking notes. I don’t have to worry about battery life. My phone runs out of battery frequently enough even without using it for notes or web browsing, because I use Bluetooth and GPS frequently. I can add little sketches here and there. 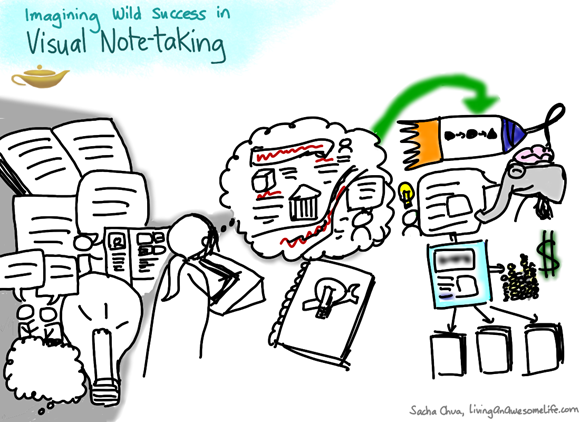 My notebook habit started in 2006, when I was a graduate student at the University of Toronto. My mom reminded me that living like a student didn’t have to mean denying myself all sorts of things, so I splurged on my very first Moleskine and started writing in it. I’ve filled a few of these notebooks over time. I don’t write in them consistently. Sometimes there are gaps of weeks or months when I take notes on my smartphone or my laptop instead. Many of the pages are lists: things I’d like to do in Toronto, reasons for starting a business, ideas to try. Many of the pages are notes from conversations. Few of the pages are straight-up journal entries like the one above, as I prefer to type in my reflections so that they’re saved in Org Mode. We have a Samsung SCX-4828fn printer/scanner/copier/fax. The scanner supports both sheet-fed and flat-bed scanning. For batch scanning on Microsoft Windows, I used Picasa’s import function. (XSane on Linux is more configurable, though.) I set up my foot switch to click on a button in the scanner program so that I could scan the next page without touching the mouse. I put the notebook on the flat-bed scanner, hit the footswitch, waited for the scanning head to finish the page, and then flipped to the next page while the scanning head returned to the ready position. You can do the same setup without a foot pedal (keep your mouse within easy reach) or a second monitor, but those things made it a lot more fun for me. Picasa makes it easy to flip through images, and I’ve been using that to “star” pages and add tags. I’ve also imported quite a few of my notes into Evernote in order to take advantage of the handwriting recognition. Haven’t done this yet, but updating my scanned notebook pages with additional notes should be easy to do with Autodesk Sketchbook Pro or something like that. Hooray for tablet PCs! I might use git or something similar for version control, but it’s not important. Partially-used notebooks are harder to scan because I have to remember to come back and scan the last section, and I can’t seem to change the import filenames in Picasa (one of the reasons why XSane is awesomer). Anyway, I’m going to focus on filling the pages of the partial notebooks, then I can scan them in one go. I tend to update previous pages in my current notebook (lists, recent conversations, etc), so I’d prefer to scan them only when the notebook is finished. 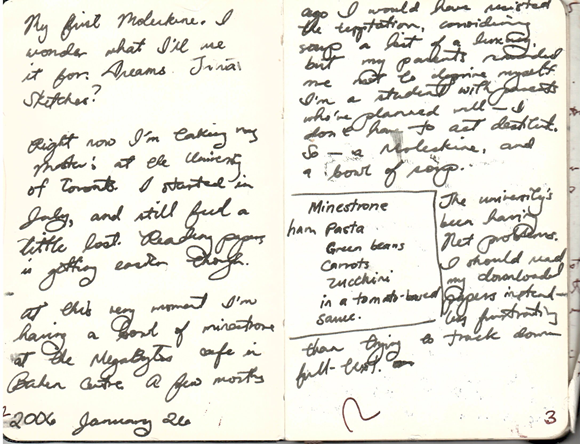 I see scanning as a way to carry digital copies of my past notebooks with me, so that works out nicely. Cursive script is hard to quickly read. I think I’ll stick to printing letters. Lists are useful for a long time. Thanks to Markus Zmija for the nudge to write about this! The new workflow looks like it works better for me. Or rather, it’s an old workflow with new tools. Now, instead of using Windows Live Writer or ScribeFire to post my notes directly to my blog, I’m back to using M-x remember and Emacs, keeping a superset of my notes in text files and publishing selected parts of it. M-x remember saves quick notes into a large text file (~/personal/organizer.org), possibly with tags, with diagrams inserted later. I regularly review and file items into the appropriate sections of ~/personal/outline.org. I post selected items to my blog using C-u M-x org2blog-post-subtree, scheduling them by adding a timestamp or using the C-c C-s (org-schedule) command. I sometimes use Microsoft OneNote on my new tablet to take notes during meetings, but it’s easy enough to convert my handwriting to text and paste it into my Org-mode file. I still have to think of a better way to refer to images while keeping my file manageable, but a filename is probably okay. This is being composed in a M-x remember window. (Well, remember is bound to C-c r on my system, so it’s easy to invoke). After I finish braindumping, I’ll use C-c C-c to save it somewhere. When I review the items, I’ll copy this into the Geek – Emacs section of my outline.org. When I moved to WordPress as a blogging platform in order to make it easier for people to leave comments, I hacked around with RSS to import my posts from Planner into WordPress (ex: http://sachachua.com/blog/2002/). Moving to WordPress meant a change in my workflow. I now had two places to store my notes: Planner and my blog. I tried Emacs Org because I liked the way it organized information. In Planner, we’d been struggling with elegant ways to manage tasks and notes that needed to be accessed in multiple contexts. The approach we had taken in Planner was to make copies of the information, but Org had a cleaner way to do it using different views. It was intriguing. When I started working at IBM, however, my information workflow diverged. I shifted to using a web-based to-do list and Lotus Notes, posting on an internal blog and an external one, and managing multiple sources and repositories of information. I wanted to go back to keeping my notes in plain text, encrypted if necessary, and to have a place where I could keep notes that might not be publishable. I still had to manage multiple computers, but synchronizing systems like Dropbox or SpiderOak got rid of some of the hassles I’d encountered with git. When I found out about org2blog thanks to a test link from punchagan, I modified the code to work with subtrees instead of new buffers, and that solved the blog publishing part of it.